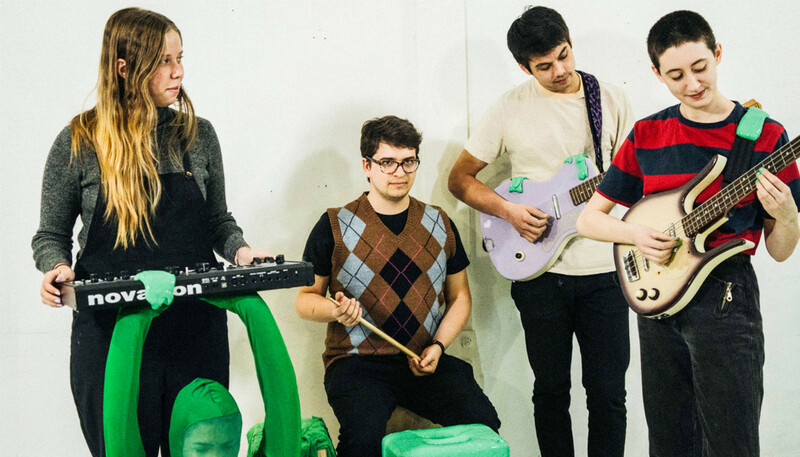 Now boasting 50-odd records to their name, indie-pop bands don’t come much more prolific than Brooklyn-based outfit Frankie Cosmos. We caught up with band leader Greta Kline to discuss signing with Sub Pop, the creative process, her nomadic existence and the inspirations behind their gorgeous new LP, Vessel. Did you allow yourself much downtime between finishing up touring Next Thing and starting work on Vessel? Um, actually we pretty much were working on the [new] album while we were on tour. We would come home from tour for a month or a couple of weeks and we would just work on new songs. So by the time we finished up touring Next Thing – which was, like, a year and a half – Vessel was already finished. You’ve always been hugely prolific, though. Would you describe yourself as a workaholic? I do feel like I’m a workaholic, but I also don’t even consider songwriting work, creatively. Do you find you have ideas spilling out of you all the time, then? Pretty much? Well, maybe not spilling out. And once in a while I’ll go a period of time where I’m not really writing a lot... I think songwriting is definitely a muscle I need to exercise. Like, it takes you telling yourself to sit down and do it. But when I am in the groove of writing a lot I get pretty addicted to it and I’ll do it every day. As a DIY artist, how are you finding it being signed to Sub Pop, and working to their schedule? It’s interesting. This is definitely the biggest label experience I’ve had, and so far it’s been really nice. There are just so many people working on the record, so it’s awesome. But it definitely makes me do the music a little bit differently because it puts more weight on each album. I got used to this feeling of everything just being a chapter, putting everything out, so putting out one album every two years means you wanna make it really good. Considering the brilliant reviews that Next Thing got, did that heap on any pressure on for this follow-up? I definitely felt a little bit of that [pressure], but more in terms of playing shows and stuff? Every time we play a show it’s a little bit bigger than the last, and I’ve definitely gotten used to that feeling of growing, so I’m just trying to keep a tab on that part of me. I’m trying not to get too used to anything, so that each time I play a show it’s awesome and a cool experience. Life must have changed quite a lot for you in the past few years, post-Zentropy. How are you coping with life on the road? Yeah, I had actually hardly ever left my home for more than a day before I started touring. So when I started touring a lot after Zentropy, I was 18 and it was my first experience being away from my home and my friends. I feel like it’s changed me. I feel like I’ve grown a lot in the last few years because travelling has brought about a big change in my abilities to take care of myself. Tour is definitely a really weird lifestyle and I don’t know if I’d recommend it... It’s definitely taken its toll on me. (Laughs) Mentally, it can just be a very trying experience to be on the road for long stretches of time, and be away from home. Just in terms of learning how to negotiate that relationship has been an interesting learning experience, and I’m growing and changing all the time. We picked up on a slight sense of homesickness on the song ‘Bus Bus Train Train’. Yeah. Actually, that’s really interesting that you noticed that, because I wrote that song when I was 17 or 18 years old and it’s about one of my first trips away from home by myself. So that song has a lot of thoughts about figuring out how to handle being away from home, redefining what is home. What was the starting point for Vessel? I think a lot of people probably make albums thinking about the whole album but for me I’m just always writing songs and then at some point I think, “Oh, this one’s going to make it onto a record.” So I guess at some point I turned around and had 18 songs that I felt like I wanted to put on the record. But I think the song ‘Vessel’ was one of the first newer songs that I knew I wanted to be on the next album. And then also there were some older songs that made the record because we rearranged them for the live set and made them feel new. How does the creative process work for you? It changes depending on where I am in my life, but since I’ve been touring a lot the process recently has been to write lyrics first, just because I’m usually in the car or at a venue and there’s not usually time to sit and write melodies or chords or anything. So I’ll write lyrics while I’m on the road and when I get home from tour, I start piecing together all the musical parts to go with the lyrics. Are we right in thinking it’s a bit more collaborative in Frankie Cosmos nowadays? Yeah... I mean, it’s always been collaborative, but I think it’s just the sound is really different because the band has changed. Every time I’ve made an album with my band it’s been the same process, which is I come in with a song and then everyone will write their parts around it, or maybe give notes to each other and try out lots of things. But I feel like when I bring a song to the band, me deciding to do that has always been me saying, “Ok, this is now out of my hands; it’s bigger than me.” I really trust the players and their ideas, and I think sometimes when you make music completely by yourself it can feel really closed off. It’s a nice feeling to let people hear what they’re gonna hear and get to see what other perspectives on the song are. Is there anything about the creative process you wanted to approach differently this time? I mean, I didn’t actively think there was any different approach but there are maybe six songs on the album that have second guitar on them, and every Frankie Cosmos song before has only had rhythm guitar on it. I think with this album I was just a little bit more open to making arrangements without thinking about how it was going to turn out live, and to exploring ideas of adding guests onto the songs and experimenting with sounds. Were there any musical reference points? Yeah, I think the thing that I hear the most is that we went on a tour with Big Thief during our Next Thing touring, and I really love that band and I love watching them live. They sometimes play with two guitars and I think when I got home from that tour at least two or three of the songs on this album came. I can just hear melodically in the chords that I was choosing to use that they were a little bit inspired by watching them play. Frankie Cosmos albums always sound like they’re made for summer. Do you ever imagine an optimum environment for your music? I don’t really. I like that though because I’m a really summery person. I hate the winter. But it’s fun because I definitely write the most songs in the winter because that’s when I’m sitting in my house. (Laughs) So maybe it’s me yearning for the warm weather to come? Lyrically you’ve always drawn from your own experiences, which makes listeners feel like they know you. Do you sense that when you interact with your fans? Some people do. It can feel a bit scary to share that much, but also the scariest part of it is that a song could be someone’s entire view of me. Like, for people listening to the music, there’s one specific part of me that they are getting to see and the people I hang out with probably get a completely different version of me. Fans are really just seeing my art, and that’s a very curated part of my thoughts. But also it can be really nice because sometimes I’ll end up making a really good friend because people feel comfortable around me because I’ve shared so much of my personal emotion. Do you see certain themes uniting the tracks? I think even having a little bit of distance and coming back in, I notice a lot of themes that run through the album. And also the songs keep changing for me, like, I feel like the meanings of the songs keep becoming more clear to me in a different way, the farther I get from having written them. I feel like there are a handful of different threads that run through the record but one of them is definitely being a musician, the expectation that comes with sharing really personal things and sharing your art with other people. And another thread is a lot of body stuff, like what is your self, what is your body and how much are they connected? And relationships is the other big one that’s all the way through. Almost all the songs are about human relationships. Why did the word ‘Vessel’ work as a banner for the whole album? I think that the theme of what a vessel is that it’s either empty or full; that you put something into or take something out of. Sometimes there’s this expectation for you to be a vessel for your art, so I think it’s about expectation a lot. And I think the word evokes all that stuff, and the album touches on a lot of different areas of that. And also the title track is about playing music and a lot of the record is inspired by that. Have you learned anything in the making of this album in particular? Oh my gosh, yes. This album stretches a really long period of my life, so some of the songs have this quality to them that’s extremely tense, with me grappling and asking questions and trying to figure out what I want and who I want to be and how to achieve it. And then some of the songs I wrote later on are way more self-assured and more fully realised of who I want to be. So I think there is this real contrast in the album because so many songs were written when I was unsure. That’s something that I noticed after the album was written; I was looking at all the lyrics and was like, “There are just so many question marks!” I think that I’m still asking a lot of questions and growing and changing a lot, but I think that the amount that I changed from starting to write this album to finishing writing it was pretty intense. You can hear my tone change throughout some of the songs and it creates this weird tension within the album.